I should note before starting this review that Rob Rogers, the author of "Devil's Cape" (the recent release from Wizards of the Coast's Discovery line), is a friend of mine. Plus, he used my last name for one of the companies briefly mentioned in the background, which clearly is the mark of a genius. Or perhaps just someone who knows that Hebert is one of the most common surnames in the book's setting of Louisiana, take your pick. And I don't mean in the "Guy Gardner was an awesome Green Lantern" kind of not-really-that-awesome, but "Batman kicking the crap out of Superman in Dark Knight Returns" awesome. In other words, it's really, really good. What I do with HeroMachine is to help bring super-heroes to life visually. Rob Rogers does the same thing with "Devil's Cape" using nothing but words, and yet his characters pulse just as vividly in my mind as anything I've ever drawn. This is a hugely satisfying, truly mature, profoundly good book, which just happens to revolve around the lives of super-powered individuals. I can't recommend it highly enough. Read on for a much more complete (and much longer) bout of gushing. I've never liked book reviews that spend ninety percent of their time telling you the plot, so I am not going to do that. Suffice it to say that "Devil's Cape" tells the story of how a new group of super-powered people come to fight for their crime-ridden city, and you're good to go. This concludes the plot summary portion of the review; now on to more interesting topics, like how good a writer Rob Rogers is. A blurb on the inside cover declares "There is NO WAY that this is Rob Rogers's first novel", and I have to agree with that feeling. Rogers has a full cast of fascinating characters with awesome powers, and he thankfully lets them take center stage. I never feel the ghostly hand of the author calling attention to himself, announcing with purple prose "A Mighty Writer Be Here". I read a lot of science fiction and fantasy, and I can't tell you how often I am disappointed in that regard. Rogers' writing is solid, deep, and completely immersive. The storytelling is fast-paced, yet full of rich and engaging detail. You never lose the sense that these are real people in a real city living real lives, and the fact that I can say that while talking about fire-breathing, flying, demon-faced, shrinking, and winged individuals ought to give you some sense of just how good a writer Rogers is. We fantasy/sci-fi aficionados are rarely so fortunate. For example, I vividly recall sitting in a theater in 1998 watching the remake of "Godzilla", which of course features a fifty foot tall fire-breathing lightning-fast lizard rampaging through downtown New York City. For some inexplicable reason, right in the middle the story stops for an interminable half hour to dwell on a vapid romance between the two leading characters. My best friend and I both turned to each other with looks of disgust on our faces, thinking the same thing: "THERE'S A FIFTY FOOT TALL FIRE-BREATHING LIGHTNING FAST LIZARD RAMPAGING THROUGH DOWNTOWN NEW YORK CITY AND WE'RE IN THE MIDDLE OF A LOVE STORY?!" That never happens in "Devil's Cape". At no point in the space of the one night it took me to obsessively devour this book did I get shaken from the grip of my suspension of disbelief. Despite the fantastic setting, the fabulous powers, and the innate silliness of the super-hero genre, I completely bought in to the whole deal -- the world, the setting, the city, the characters, the powers, all of it. 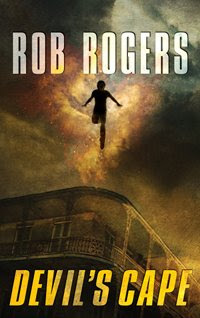 The ability to transport the reader so convincingly into the story is the hallmark of a truly great storyteller, and Rogers has definitely achieved it with "Devil's Cape". I read a review of the book a few days ago that picked a nit about the final battle. The reviewer felt lost, unable to figure out what was going on in parts. For the life of me, I can't figure out how that could happen to someone, as I felt the direction was absolutely crystal clear. There's a great sequence in one of the Millar-Hitch "Ultimates" where Captain America beats the snot out of Henry Pym, taking place first in a bar and spilling over into an adjoining construction yard. The art direction in that sequence is perfect, I felt as if I could have drawn a blueprint of the area after it was over. That final scene in "Devil's Cape" is the same thing, I really felt like I could visualize exactly what was going on. Anyway, enough with the gushing. If you like crime novels, or pulp fiction, or super hero comics, you're going to love "Devil's Cape". But to hell with that, the fact is that if you just like good writing and good stories about realistic characters living complete, believable lives in trying times, this is a novel you owe it to yourself to read. I’ll definitely consider adding it to my “to be read” list. Speaking of creating characters . . . Can you give us a progress report/ETA on the downloadable version of HM 2.5? Yes, I’m done with the final figure and have sent it to UGO for posting. Over the next week or so I’ll be going back through and fixing reported bugs, then I’ll bundle all of that, send it again to UGO, and that should be that. Jeff is right — if you like superheroes (or even the television show “Heroes”) you should rush out and get this book. It’s wonderful! Cool on both counts! Thanks, Jeff!